You don’t go to the battlefield unarmed. To think that money is the most important weapon when starting a business means lack of creativity. When you want a business to come to fruition, it’s not money that you should be thinking of first. Educating yourself about business management should be top priority. Next, you have to come up with a business idea- something like one that solves a human problem. A business plan comes right after to give you the direction on where your business is headed. Have you started making money without any cash from the start? No actual miracle is needed to make that happen. You only have to keep fueling the drive and follow these tips below. Successful businesses are not born overnight. 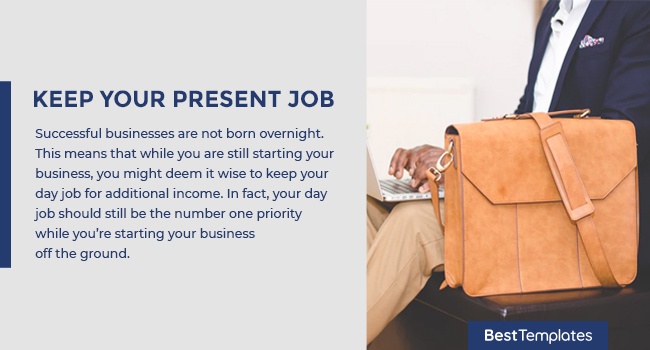 This means that while you are still starting your business, you might deem it wise to keep your day job for additional income. In fact, your day job should still be the number one priority while you’re starting your business off the ground. It’s also a good idea to make your eight hours at work as productive as possible to earn as much as you need for your business. 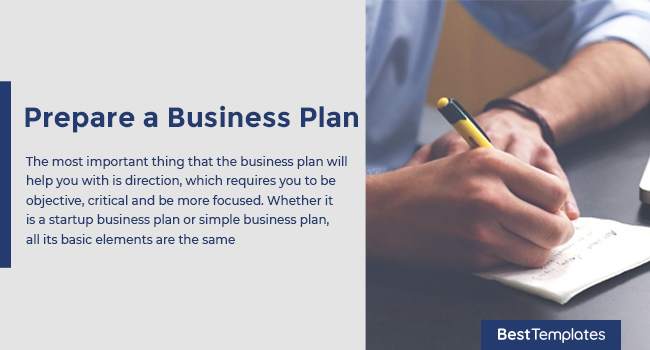 The most important thing that the business plan will help you with is direction, which requires you to be objective, critical and be more focused. Whether it is a startup business plan or simple business plan, all its basic elements are the same. 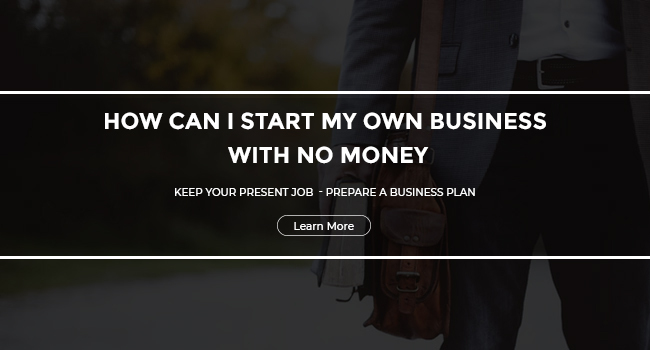 Check out our startup business plan template and simple business plan template to find out more. Our business plan templates will help you organize your business plan so that you will get that much needed investment capital from partners or be able to secure a loan from the bank. It is very important to regularly research marketing challenges for you not to miss opportunities. You need to create a strategy in order to identify your target market and set goals to make your business successful. 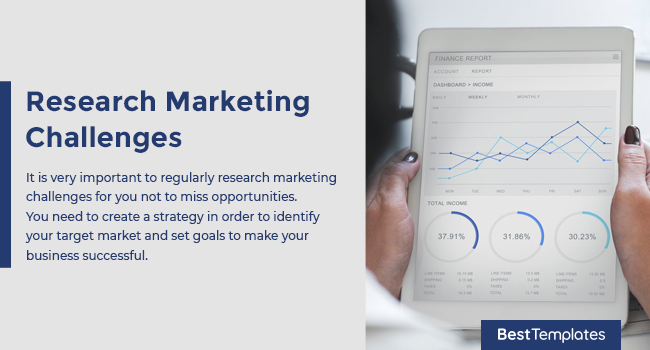 You should also do market research so you will understand the challenges that you’ll possibly face. Through market research, you’ll be able to understand the needs of possible customers and why they’ll pick you over your competitors. To do all these, have a possible marketing strategies checklist handy. You may also check out some very useful marketing plan templates here. 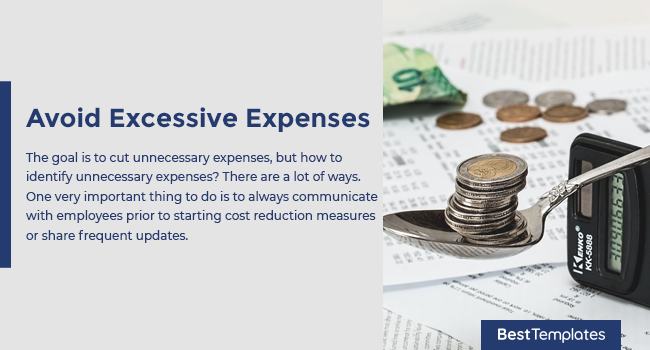 The goal is to cut unnecessary expenses, but how to identify unnecessary expenses? There are a lot of ways. One very important thing to do is to always communicate with employees prior to starting cost reduction measures or share frequent updates. This is to set their expectations and make them aware and involved on what’s going on within your company. There are a lot of financial resources available but the challenge is on how to convince investors and creditors about the viability of your business. Analyze your financial requirements first and choose the perfect funding platform to meet your needs. Next thing is to be clear about your position. You should be ready with all the right answers when your creditors ask you why your business deserves the grant to begin with. You have to keep researching through a lot of channels to find out what works best for you. Presenting your business plan and proposal properly is the key to bringing you the right funding resource. You can do so with the help of documents to get funding for small business, which will help you comply with your requirements. Networking is very important to promote your business. While face- to-face networking may be awkward if you’re not used to dealing with people on a daily basis, it may be necessary for your business. There’s another way, however, and it’s called Social Media Networking. This makes us realize how lucky we are to live in the age of social media where it’s become very easy to reach people. The internet has paved the way to comfortably interact and communicate with people through various forms. To help promote your business and make sure that only factual information that customers would likely want to hear goes out, you may need to have a media relations policy for your PR requirements. This is getting additional value out from the items that you already own, for free. You can seek help from an asset consultant to help you bring in the best of your asset performance and minimize risks. Their insights and approach will help you assess and identify long term and short term perspectives regarding the value of each asset. Oftentimes, the best way to get that much-needed money would be from close friends or family who really understand your needs. Even close friends and family need assurance of being repaid, however, so a written agreement must be prepared here. Get ready also if they ask you about your financial statements and financial plan that will benefit you and the person you are borrowing money from. To gain their trust, show them any proof that would show you are capable of paying them. Once you have gotten the amount, always make an effort to keep in touch with that family member or friend and update them on the status of your business. Even big business entities need an infusion of fresh capital to maintain and expand their operations. So it’s no wonder that startups borrow money from banks and other credit institutions. The number one reason for borrowing money, of course, is to make sure that the business has enough funds to stay afloat until returns start coming in. It’s advisable to always understand comprehensively the pros and cons of loans especially before processing small business loan documents. For most startup companies, Angel Investors are God-sent, moneyed individuals who recognize the potential of businesses before they’re even in full bloom. This is a great way to apply for funding, although you need to give up a certain share of your business to them. Also, most angel investors expect a high rate of return and that could spell disaster in case your business performs below par or is earning less than expected. Accepting angel investors may be good but just make sure all the necessary small business investment documents shall have been prepared to make your investors feel secure.. If you’ve ever heard of ‘crowdsourcing’, crowdfunding comes as its derivative. If your intention is noble and you present your business plan and proposal well enough to the right individuals who share your passion for business, then crowdfunding is a great source of capital. These people are found in all walks of life who take very little convincing, especially on business ventures, where a lot of people with business ideas are considering to help finance business startups as long as they look promising. 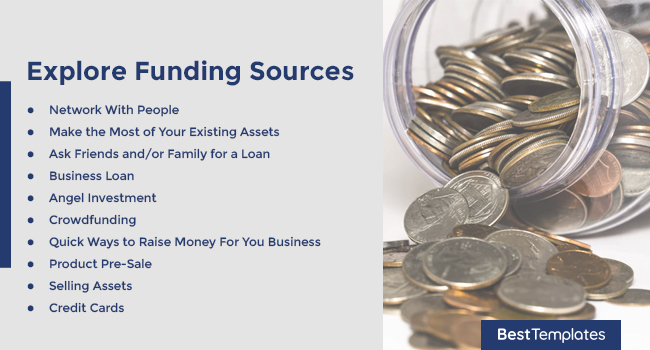 This is different from other traditional financing platforms because crowdfunding does not require payment schedules but has the power to make your fundraising project stand out. When you need to raise money for your business even if you don’t have enough capital, you must quickly find ways to finance your venture. Banks are not always willing to lend you money in difficult situations. There are a lot of unique and creative ways to raise money to help your business meet its target. For one, Crowdfunding is a popular online fundraising. Another would be through a microloan if your financial requirement isn’t too big. Whatever funding option you choose, make sure that you will comply with all terms and conditions. The term product pre-sale refers to that period from which a product is available for sale even before it officially hits the market. This strategy is usually done to test the product on the first few target customers and are offered a lot cheaper than their normal price range. By testing your product or services on the pre-sale stage, you’ll be able to gauge clearly how your business will do during the normal sale period. Selling assets will help you out from a challenging financial situation. There is usually no amount involved except if there are repairs to be made prior to selling or you are hiring the services of a professional to help you sell it. Before you decide to take either of the two, make sure you have calculated it well. According to surveys, it has been reported that over 65% of startup businesses have credit cards. Maintaining a healthy credit card limit is a convenient way to handle short -term or long- term financial obligations. It is also easier to keep track of your business spending through your monthly statements. In books, articles, and in other online sources, recruitment and retention go had in hand. 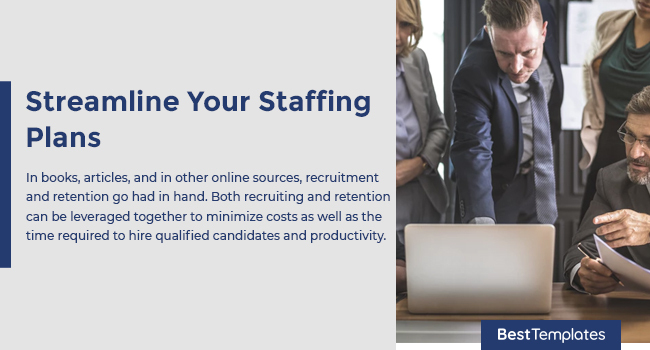 Both recruiting and retention can be leveraged together to minimize costs as well as the time required to hire qualified candidates and productivity. Time is of the essence here because the longer your business takes time to hire new staff, the more money is lost. You might find our HR Templates for Small Business Needs useful. Whoever thinks that creativity is only for artists has not exercised his creative powers well. 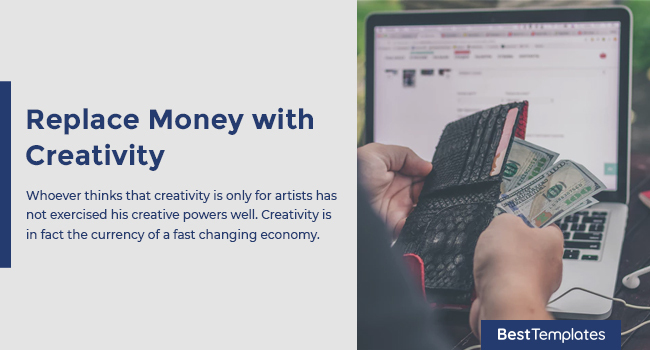 Creativity is in fact the currency of a fast changing economy. Once you have the idea and you really want to create something, you need to guard your thoughts from being throttled by money. When things start to be in order, that’s the time you start thinking of building a remarkable business that brings creative satisfaction into your own terms. Don’t let the ‘lack of capital’ reason discourage you from pursuing your dream business. Start capitalizing on your passion and experiences. When lack of funding seems to control your thoughts, focus on your own skills and knowledge first because learning new sets of skills may take longer. You may not have the budget but don’t let it hinder you from realizing your dream of running your own business. At least you’re already armed with the knowledge of what to do to start your business even without the money.